London has been one of my favourite cities since I first visited back in 2010. Since then I have been back twice and totally fallen in love with it. For someone who suffers with anxiety, a fast paced and busy city may seem like their idea of hell, which for me, it was when I was younger as I aimlessly followed my family as we frantically tried to get the hang of the tube. Us northerners are only used to trains, trams and buses, therefore when I first spotted a tube map it just appeared like a map of coloured squiggles (I had never even heard of a tube app back then). But all public transport worries aside, I have decided to write a post dedicated to my trip in June, mainly as a memoir for me and my Mum and also as a place to store a few of my favourite pictures from that trip, there are only so many instagrams you can post from the same day! Shopping of course! Within 30 minutes of arriving at our hotel, we hopped on the tube straight to Oxford Street. Getting very lost and walking towards the completely wrong end of the extremely busy road, we eventually found Lush. Anyone Lush crazy must visit the recently opened flagship store, it's definitely an experience (plus you can smell it halfway down the street, what's better than that?!). Bath bomb displays in every direction you looked as well as cheerful and friendly members of staff, despite how busy the shop was, willing to give demonstrations and recommendations. Next it was onto Liberty's and Carnaby Street. We found ourselves in the chocolate shop in Liberty's for quite some time before wandering round and exploring the beautiful building. 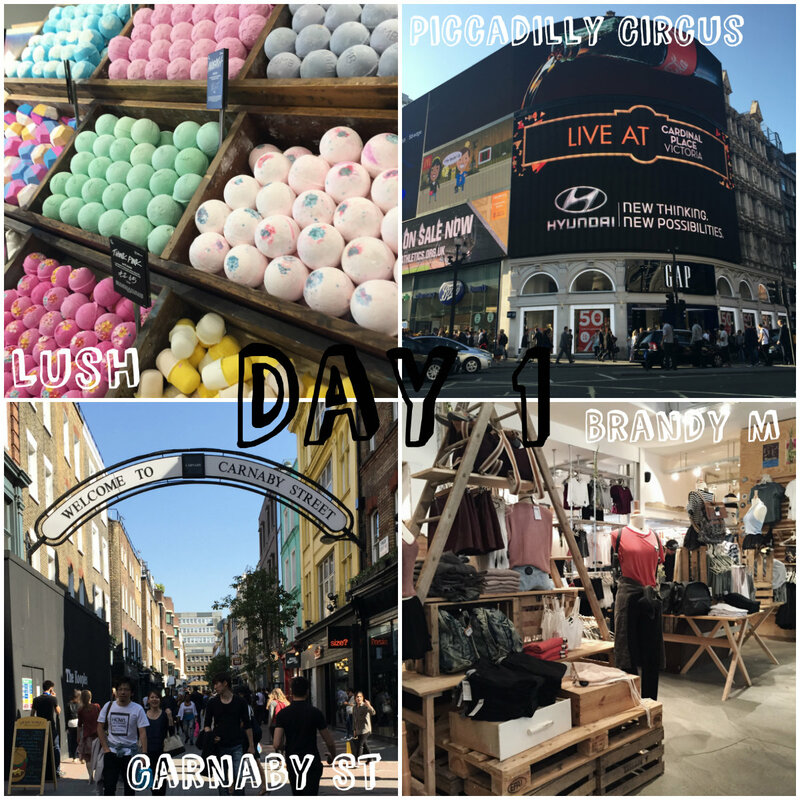 Once we hit Carnaby Street, I spotted Brandy Melville tucked away down one of the side streets and I was off. A lot of damage may or may not have been done there, I just couldn't help it, every item of clothing was so cute! Once fed and watered we made our way to Piccadilly Circus, but not before stopping off at Hamleys and staring in awe at the Harry Potter memorabilia. Tourist/sightseeing day! 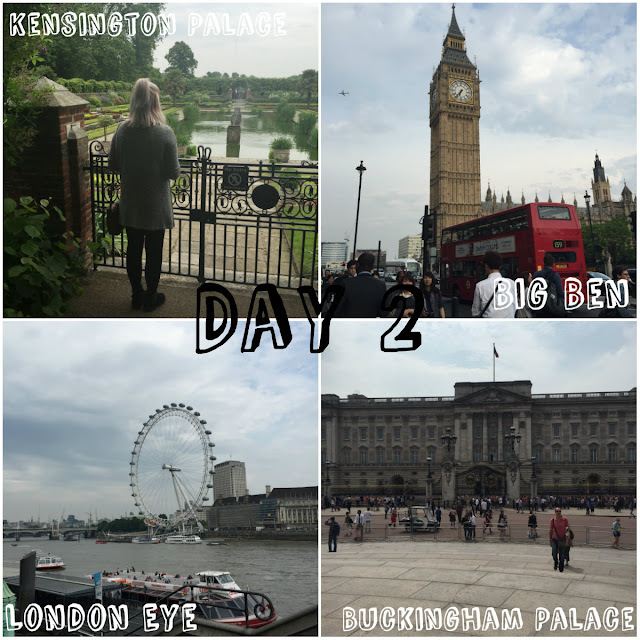 We headed to Kensington Palace and took a short walk around the gardens before strolling back to the tube station, popping into Whole foods along the way. Before tackling the crowds at Buckingham Palace, we took a pit stop in Green Park and rented out the cute little deckchairs whilst eating lunch and making the most of the sun. Buckingham Palace is the breeding ground for tourists and selfie sticks, but despite the crowds, I love going to see it and taking the obligatory selfies outside. Lots of walking was done this day, I'm surprised my feet didn't fall off, as we moved onto Horse Guards Parade. Luckily, we got there just in time to see the 4 O'Clock Parade. It was exciting to be able to see this, especially as you are allowed to watch from up close. Sights after this included Trafalgar Square, Big Ben and the London Eye, followed by a Thames River Cruise (I would highly recommend, so long as you don't get seasick). 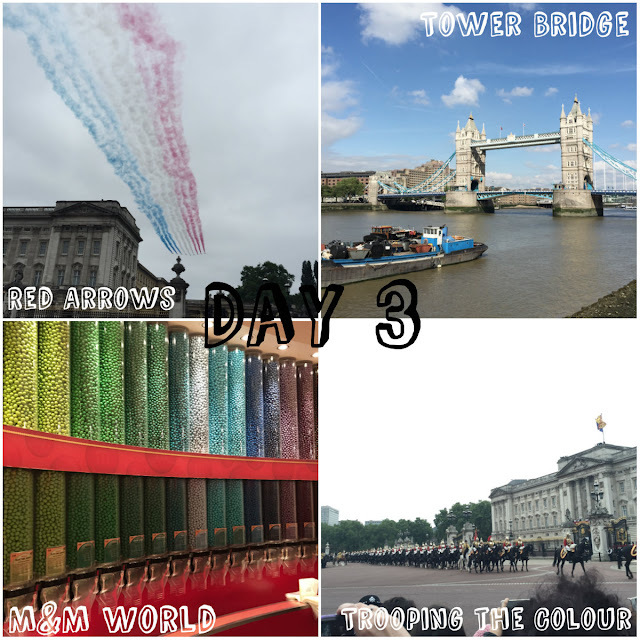 Trooping the Colour! Since planning our London trip me and my Mum were unsure whether we would actually be able to see any of the event, how wrong we were. All those gigs in my teens and weaving through crowds seemed to have paid off as I found us a good spot with only a couple of selfie sticks around us, bonus! We were right in the heart of the atmosphere and it's something I would definitely recommend going to watch if you are ever given the opportunity. Our place in the crowd meant we could watch The Royal Family pass by us, as well as having a clear view when they stood on the balcony of Buckingham Palace watching the flypast of the Red Arrows. Later that day we visited St Paul's Cathedral and the Millennium Bridge, purely so I could geek out over Harry Potter. After a walk along the Thames to Tower Bridge, M&M World in Leicester Square was next on the agenda. M&M World is worth making a trip to Leicester Square for, although it is slightly on the expensive side, there really isn't anything like it despite the fact it takes you back to your childhood. Once we grabbed our M&M's, we decided to walk to Covent Garden with a Ben & Jerry's in hand, definitely a perfect end to an extremely active day. More shopping! Day 4 started off with a (fairly) early morning trip to Camden. I have always loved Camden for the reason that it really is like no other part of London. Although it is still a popular area among tourists, it has kept it's individuality due to the famous markets and quirky independent shops you can find here. After a quick snoop around the stalls, we checked out the food markets and decided to indulge on crepes for lunch. I had a cheese one whereas my mum chose lemon and sugar, they were both very tasty and cheap! More bargains were bought before it was time to head back into the main city and seek out Harrods. By the time we reached Harrods, once we had paid a little trip to the MAC counter, my feet were in excruciating pain (TIP: wear comfy socks EVEN if you are wearing tights). As Harrods is exceptionally popular, the ice cream parlour we planned to go to had an extremely long waiting time, but we made up for that by heading back to Carnaby Street for some last minute shopping and a Five Guys! 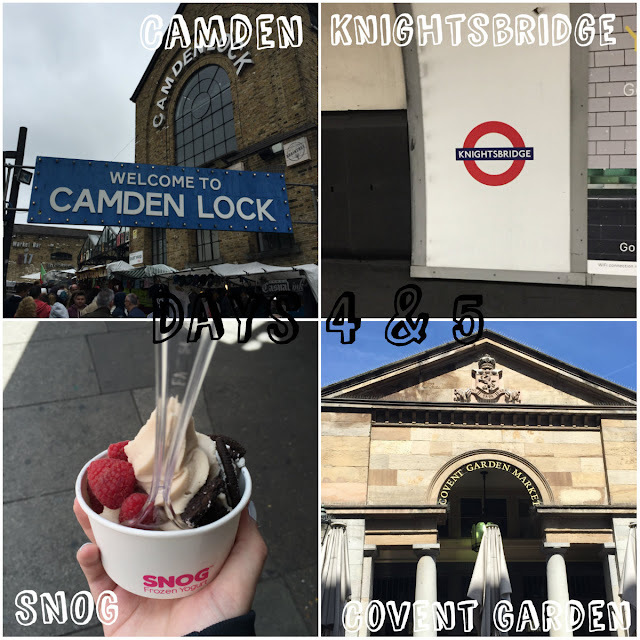 Our final morning consisted of squeezing in one last trip to Covent Garden, luckily our hotel was only round the corner. Upon realising that one of mine and my Mum's favourite shops in London, David & Goliath, was no longer there, it was time to make a quick stop at 'SNOG' for some late morning frozen yoghurt. Another look around the markets and it was time to reluctantly head to the station to catch the train home. Sounds like you got a great balance between, sight seeing culture and of course shopping! Camden and Carnaby Street are always killers for my bank balance.